Description: This three-story, triple roundhouse tower apartment complex is designed to provide affordable housing in urban areas. The towers are primarily earthen construction. Made with earthbag tubes filled with earth and tamped solid, very few manufactured/processed materials are required. This greatly reduces construction costs. The apartment name comes from the fact rainwater is captured on the roof and stored in cisterns, which reduces demand on city water supplies. Each apartment is accessible by a spiral staircase in the front tower. Features include two spacious 201 sq. ft. bedrooms with large closets, modern kitchen and bath, pantry and comfortable living room. All rooms are round to create an embracing, inviting ambience. 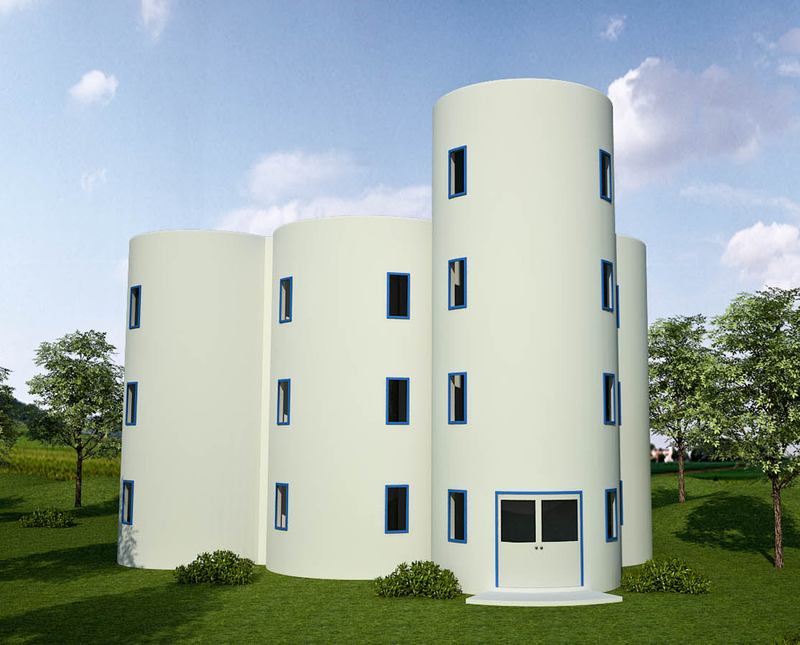 The round towers are naturally stable and form a visually striking exterior. Beautiful. Is that’s fourth floor entrance for a rooftop terrace? Yes, it can be made available to tenants or kept private for the owner as they wish. While exclusive access is appealing, some owners may prefer to use the terrace as a draw to help rent the other units. There’s a 3′ high earthbag wall around the terrace. The house was very interesting interesting. I design unique houses too. I may post some of my creatins on facebook or Mocpages sometime soon. 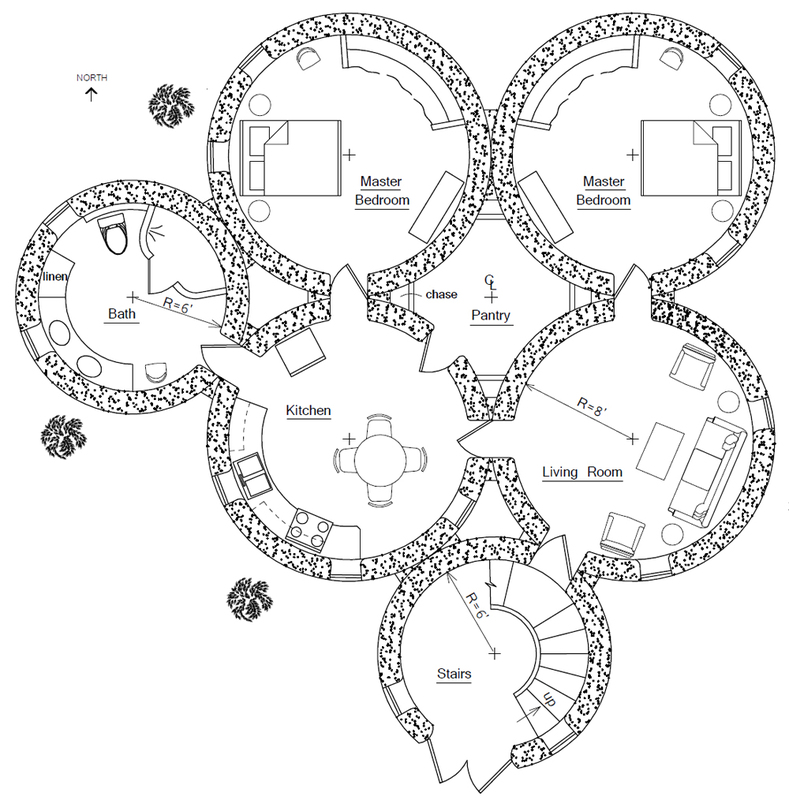 It’s the same, although you certainly could change the floorplan if you want. Is this design acceptable for the coastal area of south Texas? I know a good overhang is normal for my area (corpus christi), but is there any type of plaster or concrete that would have enough tolerance to water? It’s best for dry areas since there’s no roof. You could modify the design to provide better protection. And yes, there are plasters and coatings that are more waterproof. Can this be built in colder climates like Minnesota? Can it have a steel dome roof instead? Dome roofs are possible, but ideally you’d have a way to protect the walls from snow and rain. Do you feel a Palapa, or even several palapa’s could be anchored or constructed on the 4th floor terrace level? Yes, that could work. You’d have to build a frame. I dont see where i can buy the plans for this how do i get the plans? and is it possible to make it a 3 bedroom??? Custom plans are available for an extra fee. Email your request (preferably with a sketch saved as jpeg image) to strawhouses [at] yahoo.com for a free, fixed quote. Fascinaring to see this simple but nice building. But as I read in other places you mentiond that Earthbag houses are good for only one story. How, this is now possible to biild three? Also , I would be gratful if you mention how each floor is done i mean what and how you make the floor, and what do you consider for this particular building as roofing material. Thanking you for your kind reply in advance. what materials or building method is used for the second and third floor? cement? has anyone built a cement second floor, third? roof? These plans aren’t listed on the Dream Green Homes site, as far as I can see. Kelly just lists the most popular ones. You can order any of them simply by request. Contact him. Anything is possible. Work with an engineer who knows your codes, etc. and decide on the best option for your project. Keep in mind that earth is heavy and it’s difficult to move heavy materials to upper floors without machinery. In some countries where there’s low cost labor they use 20 workers in a chain who hand up buckets of materials. Every place is different. I show lots of different options. Anything is possible. Work with an engineer who knows your codes, etc. and decide on the best option for your project. In general, one story earthbag is most practical because soil is heavy. It’s difficult to move heavy materials to upper floors without machinery. In some countries where there’s low cost labor they use 20 workers in a chain who hand up buckets of materials. Every place is different. Choice of materials will vary depending on where you live, what you can afford, local codes, etc. A local engineer or architect will help you decide the best choice for your project. Update: I just noticed you are in Nepal. Codes in Nepal do not allow multi-story earthbag buildings for good reason. Heavy, high walls are very risky in seismic areas. Everyone has heard the law “an object in motion tends to stay in motion”. This can cause sudden collapse.